Sparkling rosé seems to lend itself to festive and holiday occasions. After all, it’s bubbly and pink. There are a number of excellent sparkling rosés on the market, but when you get into the $10 range, finding one that is light, dry and flavorful is a bit more problematic. 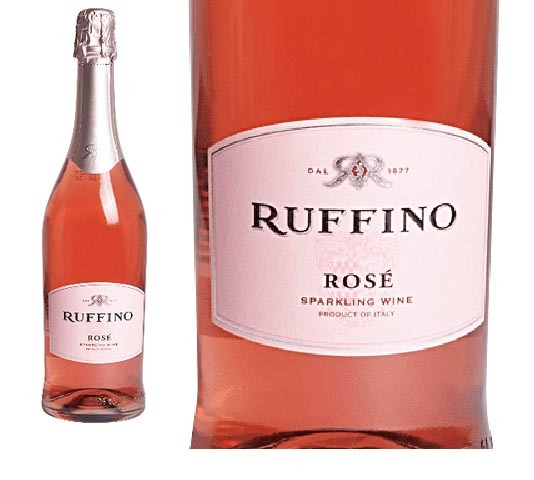 The extra-dry Ruffino Sparkling Rosé fits the bill. This wine is fresh, full of delicate berry flavors and low in alcohol content (11 percent). It often goes on sale for $2 to $5 below the full price, and it’s widely available. Although the Ruffino label is well-known and the name is associated with good, less expensive wines, the company has been making high-quality, award-winning wines for more than 140 years, mostly in Tuscany. In 1877, cousins Ilario and Leopoldo Ruffino bought a winery outside of Florence and started making wines. It didn’t take them long to hone their skills and start producing wines that not only received international accolades but also became the official wine of Italy’s royal family, the Ruffino website says. The company grew steadily, began exporting its wines and expanded its operations to other parts of northern Italy. Ruffino produced the first Chianti sold in the U.S., the one we all remember in the iconic, squat, straw-wrapped fiasco bottle. The Ruffino family sold the company in 2011 to Constellation Brands, one of the world’s largest wine corporations. Ruffino now has about 1,500 acres of vineyards and produces around 1.3 million cases of wine a year. For the last few decades, Constellation, Gallo and others have focused a segment of their growth on acquiring small, quality wine companies. In recent years, many of those acquisitions have maintained quality but increased production and marketing, which has made good wines more widely available. There’s certainly a downside to the consolidation of the wine business. I feel as queasy about big corporate wine as I do about industrial farming and food production, but I still drink the wine and eat the food; when I get the chance I buy from the little guy. But often the sellers, who built their companies through risk and hard work, reap the benefits of tens of millions of dollars from the sales, and in some cases start another boutique winery. So, as consumers, we probably benefit. Ruffino is still making excellent wine under the direction of winemaker Gabriele Tacconi, who likes to ride dirt bikes in the African desert. He started with the company before it was acquired by Constellation and after he received a degree in enology and worked and studied in France. For the sparkling rosé, Tacconi uses primarily Glera grapes grown in the company’s vineyards in the Friuli and Veneto regions of northeastern Italy. The green-skinned, white wine grape also is used to make Prosecco. Tacconi ferments Glera and Pinot Noir grapes separately into still wines. Then he blends a small amount of the red wine with the white to produce a still wine with light strawberry color. Yeast is added, and the wine undergoes a second fermentation — the Charmat method — in a pressurized stainless steel tank for a month before being bottled under pressure. The result is a sparkling rosé with light flavors of red berries and white fruit that linger through a smooth finish, Tacconi says in his tasting notes. This is an excellent wine to have before Christmas dinner, with appetizers or with the first course. It pairs favorably with turkey, but might get a little lost with some rich side dishes. It doesn’t go well with pulled pork, however; try a Zinfandel. I found some other sparkling rosés that are excellent, but a bit more costly. If you want to spend around $17, check out Antech Emotion from France and Hillinger from Austria. They are both available in Vermont, and Hillinger can be ordered in New Hampshire. In the $30 range “J” makes a very nice sparkling rosé. But for the money, it’s hard to beat Ruffino.